It felt like I knit quite a bit more than this all month, but much of it was sock and small-scale project yardage which can be hard-earned. Even though I’m a little disappointed with how low the number is, I’m rather pleased with how much I managed to get done: 1.5 pairs of socks, a small monkey, and the component of my son’s Halloween costume. Onto October! I hear that knitters–myself included–still sometimes actually finish projects they’ve been working on. Quarter 3 2011 is quickly coming to a close and so far, I have 2 FOs to show for it. Rumor has it that they also still post regularly in their blogs. What a novel idea. This is the big one, Kittens. (And the one I had hoped to get better pictures of, but The Mister is still grumpy with me since the last photo session, so I’m afraid it may never happen.) Cast on in mid-April, I thought I might never finish this sweater. When it went into hibernation for almost 2 months due to a loss of will to knit, I thought it was a goner. Usually hibernation is the kiss of death for my projects. 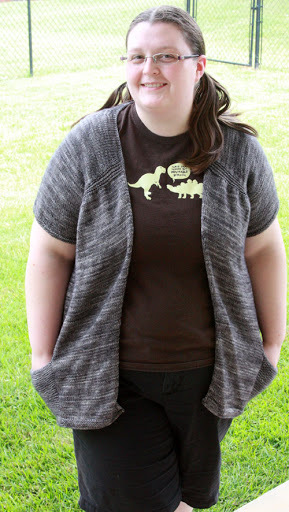 But, I pulled this back out on 31 July and knit until 16 August. Overall, I’m pretty happy with it. My biggest nitpick about this sweater is that I liked the fit much better at my pre-blocking gauge than the pattern gauge I ended up with. Reading some other Ravelers’ project notes, I was not the only person to encounter this: it would seem the pattern has some unmentioned positive ease built into it. Had I known, I probably would have gone down another size for the back and the front panels. There is a lot more positive ease in this knit than I am used to, and I’m rather self conscious about too much ease across the back of my knits. I tend to feel sloppy if the back has enough room that a small child could climb in with me. Contrary to my previous experience with this yarn, it had quite a bit of vertical growth during the blocking process, which also threw me for a loop. I had expected a little in the front garter ridges, but there was a noticeable length difference post blocking. My other nitpick is related to the first: after growth, the front garter ridges hit lower than I had been expecting and I think this adds to the impression that the knit is too big for me. It’s still a good sweater, but a bit more casual than I had wanted. It should work out nicely for the winter with long sleeve shirt underneath. The pattern is very clear and well written–the only problem being the unmentioned positive ease–and I will definitely knit it again. So, that’s my one sweater so far for 2011. I had originally hoped to knit 4 over the course of the year, but at this point, I’d be tickled pink to finish a second. I’m not in a sweater knitting mood at this moment in time and instead have gotten back into socks…. Ah, stripey socks, how I love you! I’m currently working on a toe-up “pattern” for all of my self-stripers. Plain stockinette can be dull at times, even with the thrill of the next coming stripe, so I threw in a cable on each side to add to the interesting knitting factor. I didn’t need to make these anklets, but I had been convinced they were not going to be wide enough to climb up my leg, so I lopped them off early. Turns out, I could have easily knit another 1.5-2″ of leg. Ages ago–back during last November’s blog-a-thon topic suggestion post–Ms. Katie asked me to review some yarn, my Twisted Limone in particular. Well, I can say that I’m rather pleased with how this yarn knit up and turned out. (I have yet to find how it will wear and I can comment on that later. ) I had not worked with a 100% BFL yarn to date, but I will definitely do it again. It has a nice tight twist that reminds me somewhat of Wollmeise. It does not have so many plies that it feels cotton-y, but it definitely has a more “firm” feel to it than merino based yarn I’ve used in the past. As you can see, kittens, it has lovely stitch definition. The cables pop right out at you. The dye job on this is lovely. Even with two complementary colors, there is no over-lap producing icky brown. No real white spots to speak of, either. Karen is quite a talented lady and if you all are so lucky as to catch one of her Saturday updates, I would definitely encourage you to do so! I was fortunate enough to hear rumblings of her before she took off in popularity and had a custom order made. I still have two more colorways to try out! This first pair is pretty good, but I’ve changed up a few things on the next pair I’m knitting. Oh yes, there is already another pair on needles and the first sock is nearing completion. 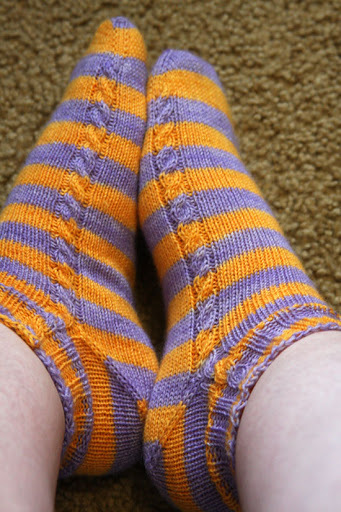 What is better than a toe-up, self-striping sock with cable details…? 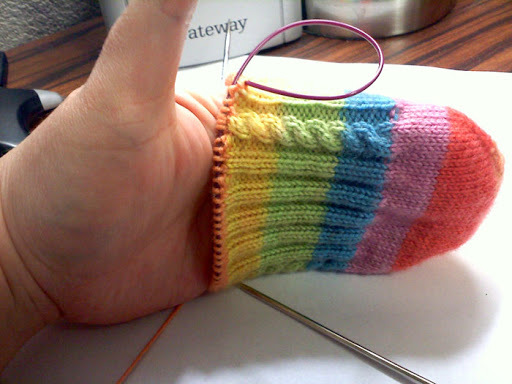 A rainbow self-striping, toe-up sock with cable details! And ribbing. I Love this, even though the KP Felici is fuzzy and difficult to take pictures of. But you already know how I feel about Felici, kittens.